Resistance to war from within the military has a long history that predates well known instances during the Vietnam War. 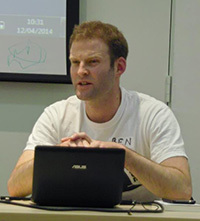 Ben Griffin, Iraq War resister and now coordinator of Veterans For Peace UK, will talk about lesser known acts of resistance to war from within the military in post 9/11 conflicts. He will also focus on the actions and plight of US Army Soldier and convicted Wikileaks whistle-blower Chelsea Manning. See this video of his address to the Oxford Union.